One more reason to have a planter is of course that they are an eye catching extra to any patio or garden space. Small ones can even be put inside your home. In no particular order, here’s our best strawberry planters selection. Very Little Space Needed: 12″ by 12″ and 18″ High. 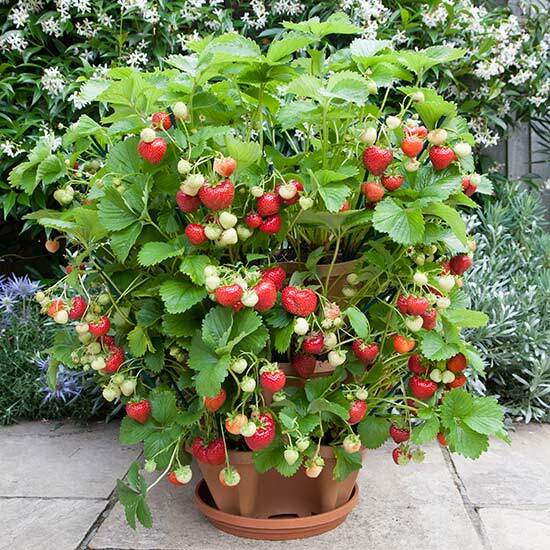 A very popular strawberry planter, this item is a great a bargain. The standard is five layers but there are other sizes available. Grow 20 Plants: It’s got a good capacity of twenty plants. This is a nice middle ground. Choose Your Size: If you buy separate layers the planter can be stacked as low or as high as you wish. This way you can pick exactly the size you want. The standard product has five layers. You can even split this into a three layer planter and a two layer planter. Different set sizes are also available, from three to seven layers. Easy Watering: Watering is easy as you only need to water from the top and the water filters down through the layers. Food Safe Plastic: The material is 5# polythene food safe plastic. So you shouldn’t need to worry about and contamination from the material. These guys make our list because they are practical, reliable, and have a range of sizes available. Easy Assembly: It’s a bag! Stylish: A little bit trendy and eight color choices. 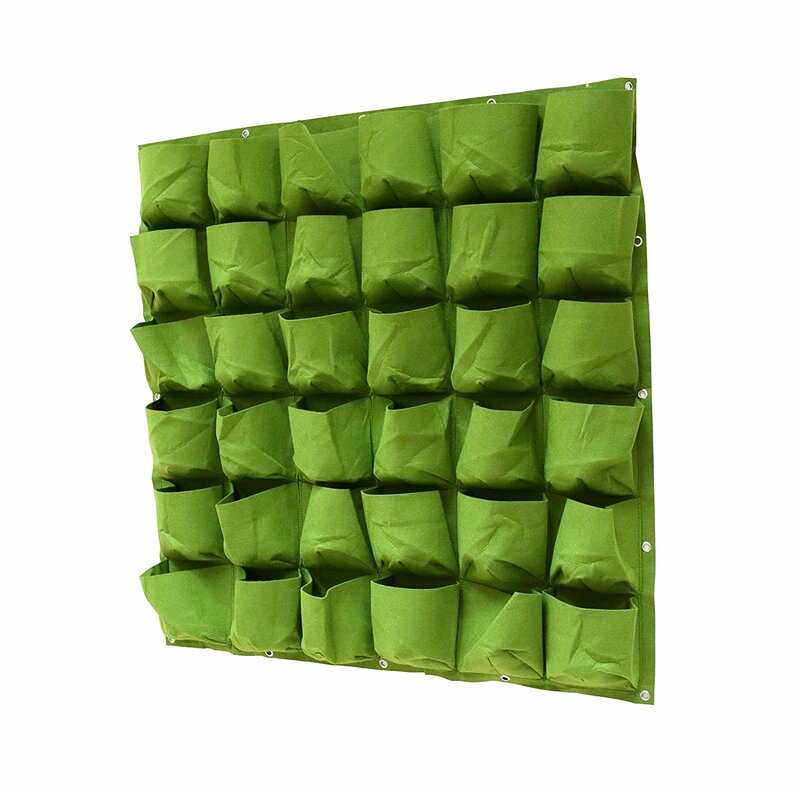 Reusable: Unlike many other grow bags this can be used many times. Stylish and exceptionally easy to use, this re-usable grow bag is a top quality item. 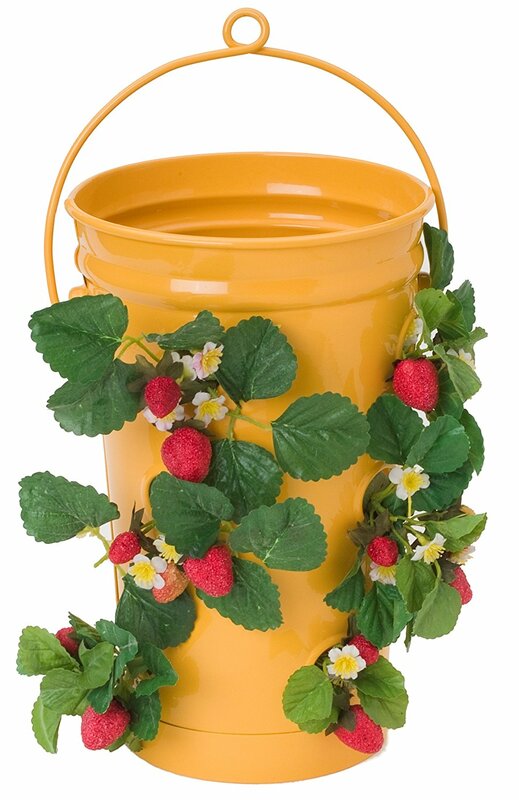 Stylish: The BloemBagz Strawberry Planter will definitley add some style to a corner of your patio. Eight Colour Choices: You have eight individual colors to choose from and the overall look is certainly very garden chick. Eco Friendly: Another reason to go for this one is that this planter is made from all recycled materials. 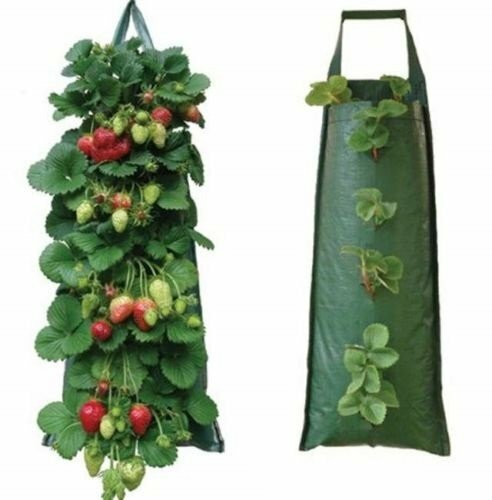 The “bagz” are also fully breathable and accommodate the strawberry plants very well. Make Plants Happy: Their tag line is that “Bloem Bagz Makes Plants Happy”. According to their marketing material the double layered breathable bags help promote secondary root growth leading to healthier plants. Small Space Required: At only 13.5″ by 13.5″ you don’t need a lot of garden or patio space for this one. Easy Maintenance: Almost no weeding needed. Also very easy to store away at the end of the season. This planter makes our list because it’s stylish, Eco friendly and very easy to pack away in winter. This is another crowd pleazer in terms of looks. It’s both durable and versatile. Twenty Plants: Twenty strawberry bunches is a nice little crop. Reasonably Priced: Under $40 is a good price for an item like this. No Assembly Required: Just fill it up with soil, plant your seeds, and Bob’s your uncle. Nice Looks: The enamel paint finish and metal body give a very timeless appearance. These hanging baskets would look great in either a country garden or a more modern setting. Choice of Colours: You have a choice many colours. Durable: The bucket is good quality and the painted finish is thick and shiny. The paint is baked on at high temperature which means these buckets are rust free and built to last. Versatile: You can chose whether to have this as a hanging piece or to place it somewhere in your garden. This planter makes our list because it looks good, you can hang it up or place it anywhere in your garden, and It’s a good quality item at a very fair price. Eco friendly fabric makes this one a lovely choice. You can decorate any wall with beautiful strawberry plants or other flowers of your choice. You can even grow lettuces and herbs in this one. Easy Hanging: reinforced metal eyelets mean easy hanging and secure fastening. Eco Friendly Material: the material is non toxic and therefore environmentally friendly. Flexible Use: place several combinations of planters together to cover entire wall spaces. Suitable for Herbs and Vegetables: Lettuces and herbs can be grown all year round. With the large amount of pockets (36) you really could have a great supply of lettuces and herbs in your home. If you by a few of the planters and cover a wall you really would have a great supply. Very Little space Required: No floor or garden space needed. just hang on a wall. This hanging planter is extremely versatile. You can hang it against any wall. You can use a few together and cover and entire wall space. This also scores extra points for being Eco-friendly. Rotates: It swivels on rollers. Can Make Compost: Special middle core for compost making. Inside and outside growing: you can grow inside and outside. Easy Maintenance: much easier than a normal garden. This one’s a bit of a Rolls Royce of strawberry planters. 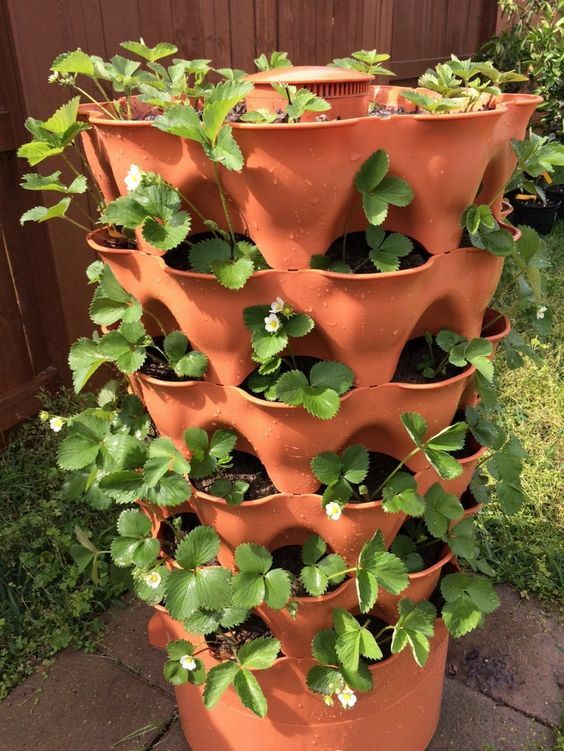 It can hold an impressive 50 strawberry plants making it a mighty beast . Not only that, it’s well equipped for other vegetables if you so desire. Easy Assembly: It has very easy assembly. You just stack the layers on each other. There are even video’s online to help you out. Extendable: It’s possible to buy more layers, if 50 plants isn’t enough. Rotating: It rotates 360 degrees. You can swivel the tower to catch maximum sunlight. Simple Watering: Watering the strawberries is extremely easy. Just water the top and it all filters down. Food Safe Plastic: The plastic is the same type as used for yogurts and other food containers. This way you know it’s safe to use. Make Your Own Compost: Put your kitchen scraps in the to the middle core to have a bit of home made mulch. Grow Outside or In: It’s suitable for outside or even inside growing depending on your available space. Easy Maintenance: Like other strawberry planters the maintenance is easy. Certainly easier than using a normal flower beds. This one makes our list because it can grow fifty plants, can make compost and has a multitude of extra features. A light weight, easy and cheap solution. With five bags grow over 50 plants. durable plastic ensures being able to use them a few times. Growing Space: 16 * 5 = 80 plants! Tough and Durable: Despite being cheap these little bags will last a long time. Easy, light weight and cheap, this is another possible option. Despite being lightweight plastic it claims to last a long time. Tough and Durable: UV treated and made from a tough polythene for a long lasting lifetime. Place Anywhere: Hang up wherever you like. Small and compact. No garden space required just hang on a wall. 16 Slots: You can plant 16 plants. 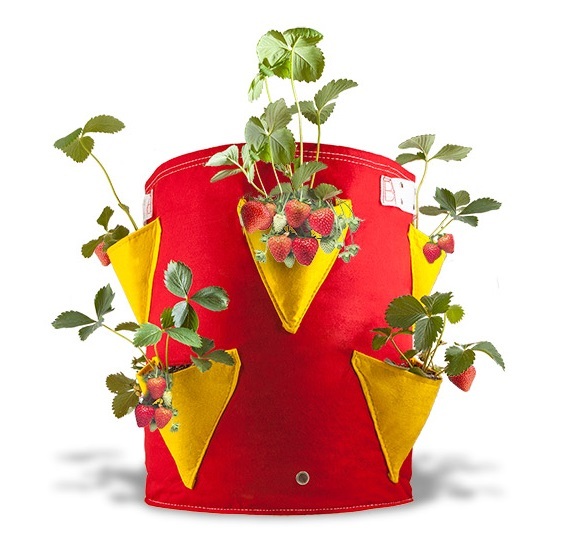 Not Only Strawberries: Flowers or herbs can also be planted in the easy to use bag. Small: It’s only 45 cm in length and just 19 cm width. These little bags are extremely cost effective, very easy to use and are tough and durable. Please tell us what you think of our best strawberry planters. Are they Ok? Do you know of anything better? Please tell us your opinions, good or bad, in the comments below. 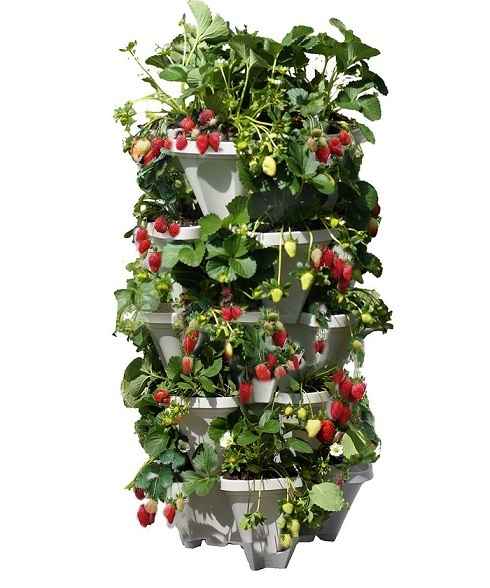 I would pick Enamelled Hanging Strawberry Planter or the Vertical Wall Garden Planter simply because they look more stable. I fear that the Garden Tower is vulnerable in terms of falling down easily especially when there is so many levels being stacked up. Still, my opinion aside, seems that all of these are quite innovative and more interesting, let alone convenience compared to the conventional flower or raised beds. Hi Tar, thanks for the comments. The garden tower has supporting legs so will be very stable, but I see what you mean. I also like the vertical wall planter, many plants in a small space against a wall with eco friendly material. Thanks again. I like the idea of the strawberry growers. I have grown strawberries the usual way as you mentioned – just in the ground in the garden but it is true that too much rain could ruin them. Some of these methods would be also great if adapted to grow other things like herbs or even flowers. Thanks Greenvee, yes almost all of these could be used to grow herbs or flowers. Garden tower is a bit pricey at full retail price but if you follow the links on my page there’s usually a special offer of some kind.